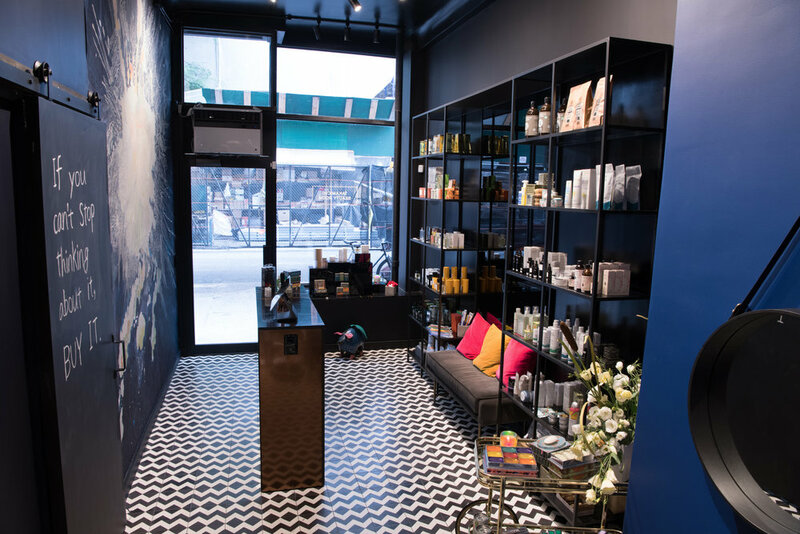 Discreetly tucked away in a hushed pocket of Gramercy is Takamichi Beauty Room: a jewel box that’s equal parts apothecary, salon, and neighborhood hangout. Takamichi Saeki, who’s been a beloved fixture in New York’s creative and social scene for over 25 years – he was formerly a gallerist – always wanted to extend his vision to a different type of service and retail experience for beauty and grooming. And with Takamichi Beauty Room, he accomplishes just that. As with his stylish, art-filled salon on Bowery, the space is a collaboration amongst friends. Appvelvet served as the architect, Sandra Van Rolleghem led the overall creative vision, and artist Santi Moix painted a striking, oversized mural of Hanabi (Japanese fireworks) to celebrate and honor Takamichi’s heritage. To steer clear of how most skincare boutiques and apothecaries look, sterile white is boldly swapped out with black and midnight blue. The space is made even chicer, thanks to velvet seating and punchy hot pink and yellow Maharam pillows. “I'm very Japanese, in that I believe a place should please all your senses: sight, scent, and touch. Everything should come together to lend pleasure – even when buying something as humble as a toothbrush." Services include personalized, bespoke haircuts for men and women, blowouts, and updos. There’s even a private nook for clients craving a more discreet experience, whether it be a private cut or a group gathering, like prep for a bridal party. Upon first glance, the brand lineup might seem a bit eccentric – which is all part of Takamichi’s vision. Because beyond having a natural and eco-conscious bent, everything he stocks has to be functional and truly special. The goal? To curate an experience where buying an everyday item (such as deodorant) is as fun and informative as purchasing a Cire Trudon candle. Exclusives include Lamazuma, a French vegan, organic, and zero-waste product line, and Terre De Sommieres, a “miracle dust” that erases stains naturally. Other hand-picked items rounding out the quirky roster include Ortigia’s luxurious bath and body products, Lord Jones's CBD cream and edibles, and Mary Allan organic face oil and serum. Takamichi Beauty Room is located at 125 E 17th Street, next to Bar Jamón and Casa Mono.